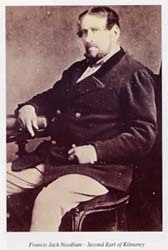 Francis "Black Jack" Needham, 12th Viscount Kilmorey (pronounced Kilmurray) was created Viscount Newry & Morne and Earl of Kilmorey in 1822. He died in 1832 and was succeeded by his son, also Francis Jack. The Irish estate, Mourne Park at this time amounted to nearly 55,000 acres and the Earl marked its boundaries by building a granite wall: the "famine wall" round the perimeter, giving cheap employment to a near starving community during the potato famines of the 1840s. The 2nd Earl is first recorded in Twickenham in 1844 he having sired a child by his mistress Priscilla Anne Hoste. The boy, Charles was born in Cross Deep on 19 July that year and the birth registered on 22 August, the Registrar being James Gooch. A note in the margin by Gooch confirms that Needham was the occupier of the house, believed to be Cross Deep House, opposite Radnor House. Kilmorey may also have owned or occupied Radnor House, at this time. However, he did not stay long. In 1846 he moved downstream, acquiring Orleans House and plans were prepared by Henry Kendall for a makeover in the Italianate style. These were not carried out although a similar design for Radnor House by Henry Kendall Jr was completed at this time. Kilmorey bought further land in the vicinity, including land and a property (no6, now no4)in Montpelier Row. However, by 1851 he had moved downstream again, buying St Margaret's House, which he demolished and rebuilt by 1852. At about the same time he bought Gordon House (then called Railshead), which he occupied. But not for long. His mistress Priscilla became ill and died in 1854 at their London House. 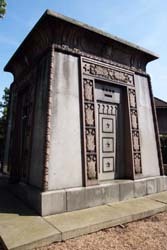 Henry Kendall had designed and built a mausoleum for Priscilla which was first erected in Brompton Cemetery. It was a handsome structure in the Egyptian style. This year Kilmorey moved away from St Margaret's, selling St Margaret's House and leasing Gordon House to Thomas Chandler Haliburton. In 1862 he moved to Woburn Park, Chertsey, taking the mausoleum with him. In 1867 his wife died; he re-married soon after and moved back to Gordon House, bringing the mausoleum with him, to its last resting place. He built a tunnel under a road to connect Gordon House to the mausoleum. He is said to have rehearsed his obsequies by lying in a coffin on a trolley which was pushed from the house to the mausoleum by his servants, via the tunnel. He never allowed either of his wives to enter the interior of the mausoleum. He died at Gordon House in 1880 and was taken into the mausoleum to rejoin Priscilla. His second wife lived for another 28 years. The family motto of the Needhams is nunc aut numquam (now or never) and it seems to have informed Jack's life.